These circular cups come with self-locking support, representing a true mobile clamping system. In terms of components, the first worth mentioning is the sturdy anodized aluminum support, which comes with a wide surface at the base, limited by a seal that serves at fixing the item to the bearing surface. 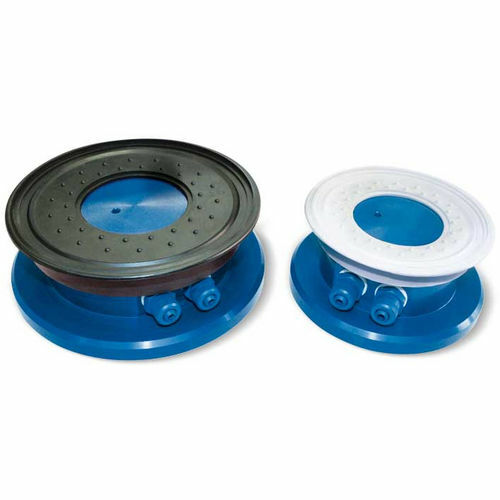 The standard circular flat cup is cold-assembled onto the upper part of the support for gripping the load, and there are two quick couplings for vacuum connection. The detection of vacuum for releasing support and gripping is possible and can be made via vacuum valves of a three-way type, or solenoid valves. All the cups come with self-locking support and can be used simultaneously at the same height, even if they are of different types or come in various sizes.